CONVERSABLE ECONOMIST: Is the World Bank Becoming Obsolete? The World Bank is facing what I think of as a March of Dimes moment. The well-known March of Dimes charity was founded in 1938 with a focus on fighting polio. But after the Salk vaccine was licensed for use in 1955 and polio declined rapidly, the charity did not close up shop. Instead, it shifted its focus first to birth defects, and then to issues of healthy pregnancies and premature births. A combination of growth in lower-income and middle-income countries around the world and change in their economic development challenges is leading to a similar crisis in the mission of the World Bank. Scott Morris and Madeleine Gleave lay out many of the issues in "The World Bank at 75," published in March 2015 as Policy Paper 058 by the Center for Global Development. They write: "As a lender to “LICs” and “MICs,” the World Bank will be reaching the limits of its usefulness in much of the developing world in the years ahead. 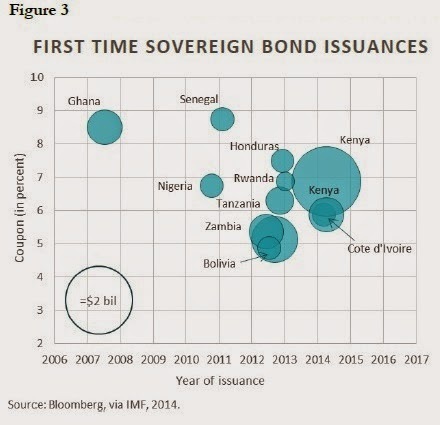 It will continue to play an essential role in a relatively small number of fragile states, but the rest of its core lending model could very quickly become irrelevant to most of its other current borrowers. ... On its current path, the World Bank will soon enough be viewed as no longer essential." Although the rhetoric used by the World Bank to describe its mission has changed over time, most of what the World Bank actually does has been broadly the same for decades. It makes loans to national governments, with a heavy focus on infrastructure investment, with one set of loans and conditions for low-income countries and another for middle-income countries. This model is under challenge from several directions. First, with sustained growth in many low-income and middle-income countries around the world, the number of countries eligible for World Bank loans is likely to fall the next few years. 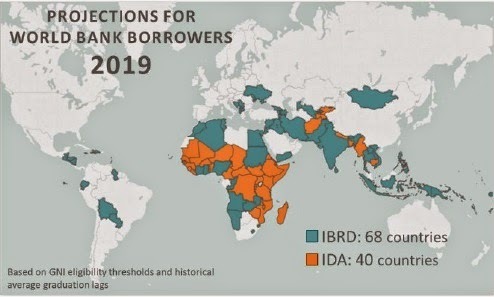 Morris and Gleave offer a map of the countries eligible for World Bank lending in 2015, with the countries meeting the low-income (per capita) guidelines in orange and the middle-income countries in blue. They then project what countries will fall into those categories just four years from now in 2019. Either the World Bank is going to adjust its income guidelines substantially, or it is going to become very focused on Africa and south Asia in the next few years. More generally, financing outside of traditional ODA sources (including the World Bank) are becoming increasingly important for developing countries. Foreign direct investment (FDI) from OECD countries has more than doubled over the last ten years, and is now 1.7 times as large as total ODA. Remittance flows to developing countries, too, are growing rapidly, totaling $430 billion in 2014. And due to their nature as direct income transfers, remittances have a first-order effect on poverty unmatched by many other flows. ... And domestic resource mobilization has become an increasingly important source of public financing, as least-developed and lower-middle income countries have doubled domestic tax revenues in the last decade to total almost $14 billion. Along with the financial flows from remittances, foreign direct investment, and a newfound ability for low-income countries to issue sovereign debt, there is even new competition in the world of development banks. 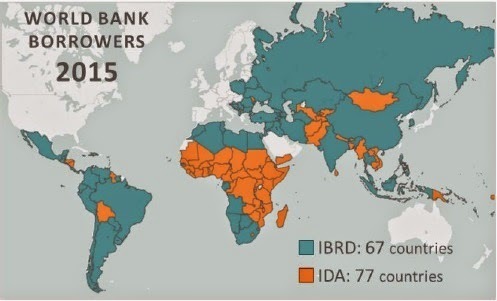 There are existing regional development banks with growing financial clout like the Inter-American Development Bank (IDB), the African Development Bank (AfDB), and the Asian Development Bank (AsDB). As the authors note: "In 2014, the World Bank’s third largest shareholder, China, announced the creation of a new multilateral development bank for Asia, the Asian Infrastructure Investment Bank (AIIB). At the same time, the Chinese also joined with the other “BRICS” countries, representing over one-fifth of the World Bank’s shareholders and some of the bank’s biggest borrowers, to plan for a new global MDB, the New Development Bank." Maybe instead of a focus on infrastructure, the World Banks should shift some of its emphasis to public goods like research and development for agriculture or disease prevention or reducing air pollution. Or course,these kinds of projects typically involve a large component of grants, rather than loans. Maybe the World Bank should put more of its focus on crisis response, like its recent response to the Ebola outbreak, or on dealing with economic risks like the danger that the price of a key agricultural export commodity will fall. Maybe instead of focusing on loans to national governments, the World Bank should consider loans to subnational areas, like water or transportation infrastructure for a certain city, or loans to regional areas, like transportation and electricity networks across national borders. Maybe instead of making loans based national per capita income, the World Bank should focus on countries where high levels of deep poverty remain, or on countries that combine low income with issues like a high level of debt accumulated in past decades that is hindering future growth, or a lack of capacity to manage public finances and collect taxes. Many researchers naturally look at the World Bank as an institution that could be a knowledge leader and a clearinghouse for what is known about how to make economic development work. This mission would emphasize that World Bank loans and projects should be designed to produce the kinds of measureable inputs and outputs that can be the grist for academic research. The World Bank has tinkered with some of these kinds of evolution. In particular, the branch of the World Bank that works with private sector investors (the International Finance Corporation) has been growing in size. The idea is that these investments will focus not just on profitability, which they are achieving, but also on projects that bring additional development benefits and that would not otherwise get funding from private investors, which are harder to demonstrate. But as the World Bank takes a good look at itself in the mirror, here's the hard question it needs to face. It's easy to list global problems that need solving. But is the World Bank only trying to justify its continued existence by looking for new tasks? Or can the World Bank identify areas where its own specific skills and capabilities will have a high payoff for economic development?